Don't you think this look lovely? A refreshing cooling dessert to beat the heat in this hot and hazy weather...... tangy and fragrant! Pour 1 packet of Konnyaku Jelly powder into a pot. Add 1 litre of water and 250 ml Lemon Kumquat Vinigen, mix well, keep stirring and cook till free from lumps. 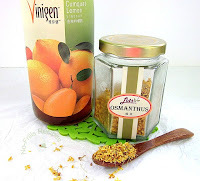 Once the mixture is boiling, turn to low heat, add in the Osmanthus flowers, stir well for another 3 minutes. Turn off heat and add in the malic acid, stir till dissolved. Pour mixture into jelly moulds. 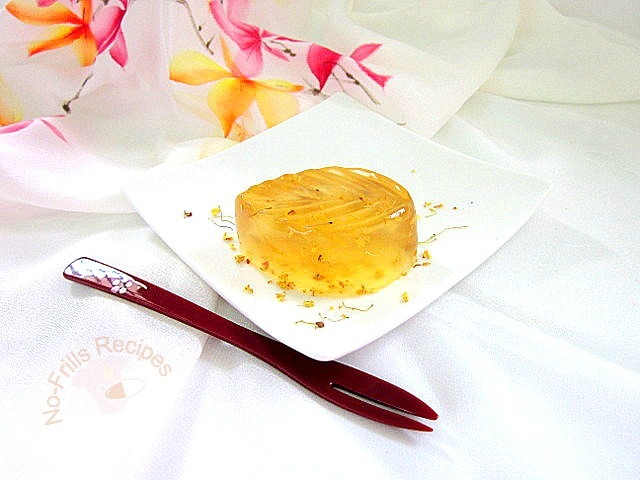 Allow jelly to set before placing into the refrigerator, preferably overnight. Thank you, Ann! Yes they're indeed refreshing. Kumquat is one of my favourite fruit. 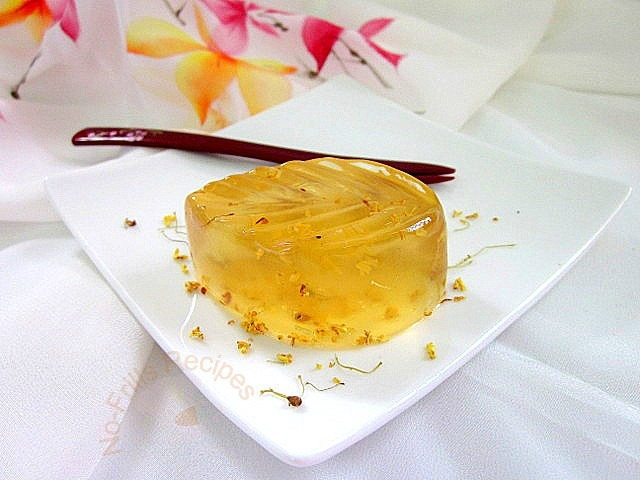 And indeed having this jelly dessert in the hot weather sure to be cooling to our body. Are we able to buy this lemon kumquat vinigen here locally? 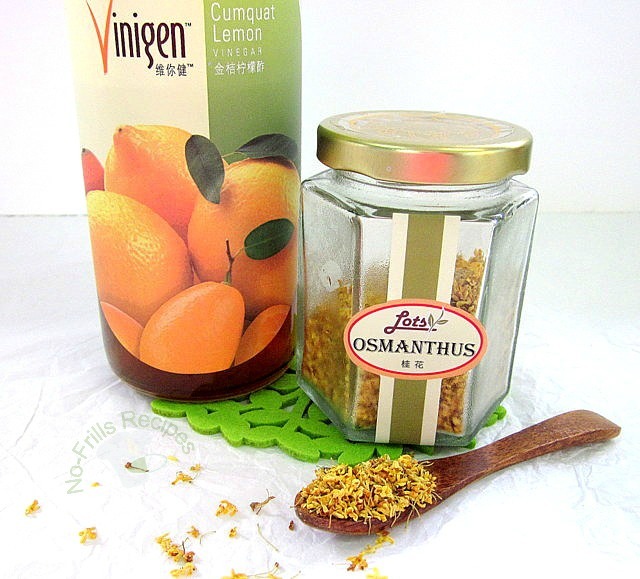 This kumquat vinigen is from Eu Yan Sang. Can't agree with you more. Ooo...I'm salivating rightnow. Your jelly look awesome. Hope you're going to have a great week ahead dear. Thank you, Kristy. Hope you enjoy your day too! I hope this chilled dessert will help to give you some relief from your sore throat. Not only is that Jelly stunning, I would imagine it sure is refreshing too, Cheah! I'm not familiar with Lemon Kumquat Vinigen but I sure wish I was! so pretty looking, the jelly and the little fork too! Nice clicks ... sure a refreshing dessert for this hot weather. Thanks, Chris! Yes, it does help. 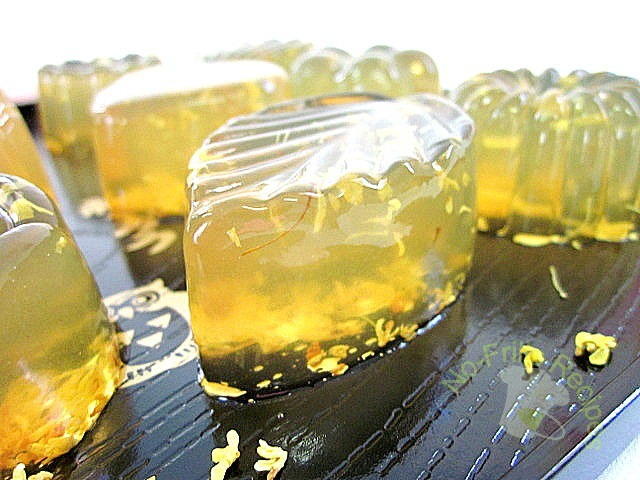 Cheah, your osmanthus jelly looks ever so pretty! 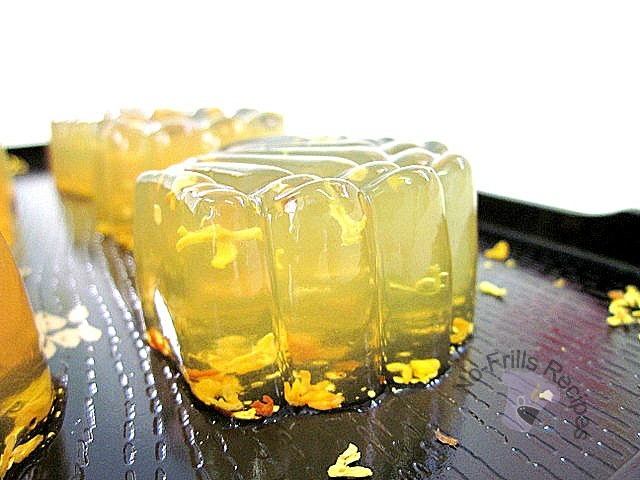 Wow this is a great jelly dessert recipe. But it seems that I don't want to eat it anymore because of the lovely design. LOL. Thanks for sharing! Ha, ha.... admire first then only eat! Hi, May I know is there any vegetarian desserts ? I think this is a vegetarian dessert. But need to look at the ingredients to confirm. When we buy the Konnyaku jelly powder, it comes in a packet. Then follow the instructions at the back of the packet. You can hop over to this post to check out how the packet looks like. Hope this helps and thanks for dropping by my blog.